In the Hands of a Child is one of the main companies that come to mind when I think Lapbook! Not familiar with lapbooks? Well they are basically 3D, interactive books that a child will assemble booklets to paste into file folders to make a presentation style when completed. All that they learn is visually available for their review and for sharing with others.. Dad and grandparents for example. It is very hands on, and while the child is learning, he is also coloring, writing, pasting and assembling. Lapbooks are a fantastic way for my busy boys to learn! Lapbooks are geared for ages. They subjects range from Math, Biblical, History, Holidays, Just for Fun, Arts, Science, Language Arts and more. The older the child gets, the more detailed the lapbook will be. 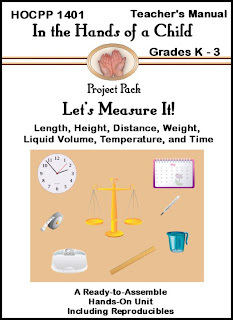 Let's Measure It is geared for K-3 and I thought it would be a great way for Maverick to start off his math curriculum for K. He wants 'real school' this year and has always enjoyed making lapbooks. One aspect that Hands of the Child did differently was have a planning guide for working on the lapbook. This particular one was scheduled for 6 days. Many of the others I have worked with were just a line up of papers and where to put them, not with any clear direction on how long to work on each thing. This was really very helpful to me for metering it out. Additionally they included Related Reading, books you can find at the library to go along with the lapbook. Also Bonus Activities just or fun, to reinforce what is being learned. My K student doesn't write much yet, so it was necessary for him to speak the answers to us to be written down. Just realize that if you have a pre-reader and writer that they will need this extra help. 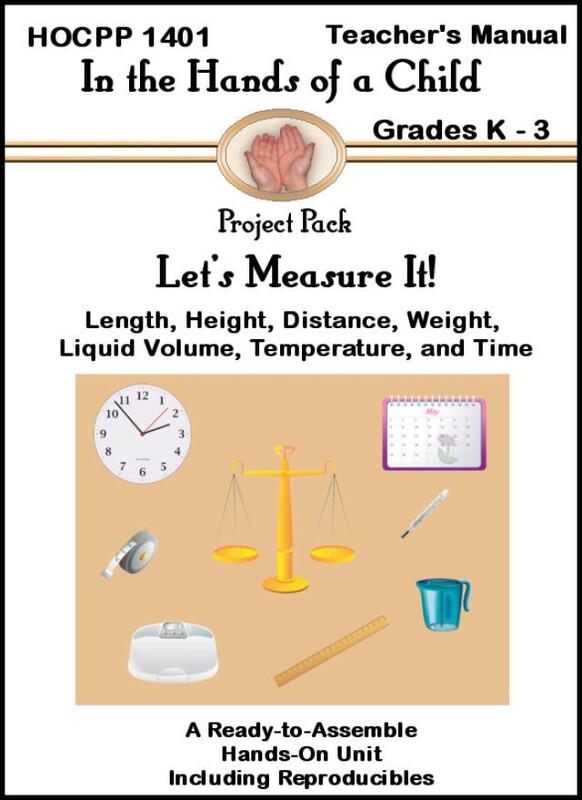 We were able to learn some key elements in this lapbook study. Measuring Weight, Length, Volume, Temperature, Time and Length. Also it included Days of the Week and Months. In the Hands of a Child has a huge variety of lapbooks to choose from, and often even have them on sale! Their prices are fantastic and you have the option of purchasing the ebook $12, cd $17 or printed versions $20 of the lapbook based on your needs. I reviewed the ebook and just had it printed at the printer. No need to bind it as we just cut up a majority of it and folded, colored and pasted! This seemed to be the most economical way to utilize this product. Now that is my kind of school! See what other Hands of a Child products my friends reviewed by clicking on the banner below!